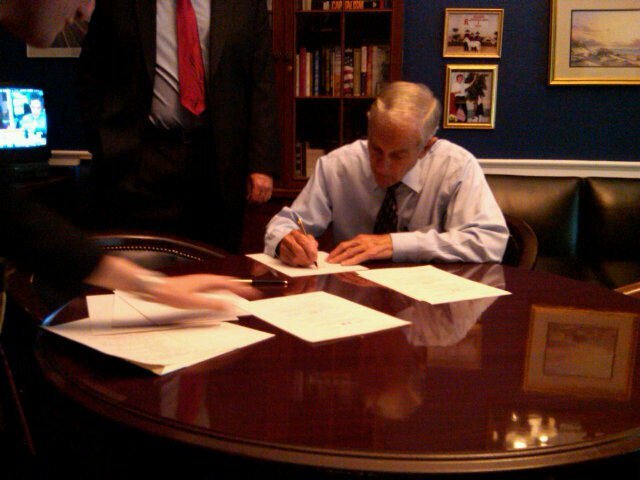 Ron Paul signs copies of the Industrial Hemp Farming Act, which is printed on hemp paper. This is as real as is the fact that hemp is superior to wood for making that paper... and that the hemp for that paper must have come from outside America, as it is illegal for American farmers to grow hemp in America... even as it is about the most profitable industrial crop a farmer may grow on God's Green Earth. A Canadian farmer likely profited to make that paper... perhaps Belgian... Indian... Chinese... definitely not the work of an American farmer, in America today. As it appears hemp shall be made legal to grow in America in 2011, and shall soon become one of the USA's most important crops, now is the time to learn the real potential of hemp - we are planning for this one simple plant to bring 10,000s jobs to the Northeast Ohio area, not including farming, within 3-5 years. Industrial hemp is a variety of Cannabis sativa and is of the same plant species as marijuana. However, hemp is genetically different and distinguished by its use and chemical makeup. 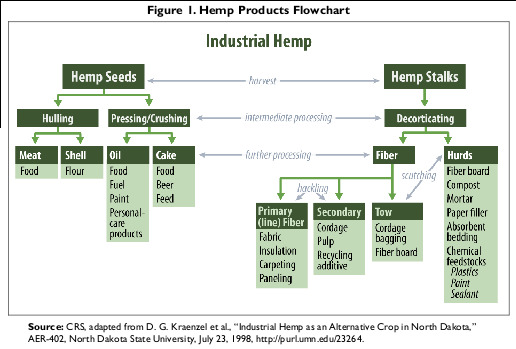 Hemp has long been cultivated for non-drug use in the production of industrial and other goods. Some estimate that the global market for hemp consists of more than 25,000 products. It can be grown as a fiber, seed, or other dual-purpose crop. Hemp fibers are used in a wide range of products, including fabrics and textiles, yarns and raw or processed spun fibers, paper, carpeting, home furnishings, construction and insulation materials, auto parts, and composites. The interior stalk (hurd) is used in various applications such as animal bedding, raw material inputs, low-quality papers, and composites. Hemp seed and oilcake are used in a range of foods and beverages, and can be an alternative food protein source. Oil from the crushed hemp seed is an ingredient in a range of body-care products and also nutritional supplements. Hemp seed is also used for industrial oils, cosmetics and personal care, and pharmaceuticals, among other composites. Precise data are not available on the size of the U.S. market for hemp-based products. Current industry estimates report that U.S. retail sales of all hemp-based products may exceed $300 million per year. Because there is no commercial industrial hemp production in the United States, the U.S. market is largely dependent on imports, both as finished hemp-containing products and as ingredients for use in further processing. Under the current U.S. drug policy, all cannabis varieties, including hemp, are considered Schedule I controlled substances under the Controlled Substances Act (CSA, 21 U.S.C. §§801 et seq. ; Title 21 CFR Part 1308.11). As such, while there are legitimate industrial uses, these are controlled and regulated by the U.S. Drug Enforcement Administration (DEA). Strictly speaking, the CSA does not make growing hemp illegal; rather, it places strict controls on its production and enforces standards governing the security conditions under which the crop must be grown, making it illegal to grow without a DEA permit. Currently, cannabis varieties may be legitimately grown for research purposes only. Among the concerns over changing current policies is how to allow for hemp production without undermining the agency’s drug enforcement efforts and regulation of the production and distribution of marijuana. In the early 1990s a sustained resurgence of interest in allowing commercial cultivation of industrial hemp began in the United States. Several states have conducted economic or market studies, and have initiated or passed legislation to expand state-level resources and production. To date, nine states have legalized the cultivation and research of industrial hemp, including Hawaii, Kentucky, Maine, Maryland, Montana, North Dakota, Oregon, Vermont, and West Virginia. However, because federal law still prohibits cultivation, a grower still must get permission from the DEA in order to grow hemp, or face the possibility of federal charges or property confiscation, despite having a state-issued permit. Over the past few Congresses, Representative Ron Paul has introduced legislation that would open the way for commercial cultivation of industrial hemp in the United States (H.R. 1866, 111th Congress; H.R. 1009, 110th Congress; H.R. 3037, 109th Congress). The Industrial Hemp Farming Act would amend Section 102 of the Controlled Substances Act (21 U.S.C. 802(16)) to specify that the term “marijuana” does not include industrial hemp, which the bill would define based on its content of delta-9 tetrahydrocannabinol (THC), marijuana’s primary psychoactive chemical. Such a change could remove low-THC hemp from being covered by the CSA as a controlled substance and subject to DEA regulation, thus allowing for industrial hemp to be grown and processed under some state laws. For centuries, industrial hemp (plant species Cannabis sativa) has been a source of fiber and oilseed used worldwide to produce a variety of industrial and consumer products. Currently, more than 30 nations grow industrial hemp as an agricultural commodity, which is sold on the world market. In the United States, however, production is strictly controlled under existing drug enforcement laws. There is no known commercial domestic production and the U.S. market depends on imports. Over the past few Congresses, Representative Ron Paul has introduced legislation that would open the way for commercial cultivation of industrial hemp in the United States (H.R. 1866, 111th Congress; H.R. 1009, 110th Congress; H.R. 3037, 109th Congress). This legislation, or other legislation related to hemp cultivation, could be introduced in the 112th Congress. Hemp production in the United States faces a number of obstacles in the foreseeable future. The main obstacles facing this potential market are U.S. government drug policies and DEA concerns about the ramifications of U.S. commercial hemp production. These concerns are that commercial cultivation could increase the likelihood of covert production of high-THC marijuana, significantly complicating DEA’s surveillance and enforcement activities and sending the wrong message to the American public concerning the government’s position on drugs. DEA officials and a variety of other observers also express the concern that efforts to legalize hemp—as well as those to legalize medical marijuana—are a front for individuals and organizations whose real aim is to see marijuana decriminalized. Hemp production in the United States also faces competition from other global suppliers. The world market for hemp products remains relatively small, and China, as the world’s largest hemp fiber and seed producer, has had and likely will continue to have major influence on market prices and thus on the year-to-year profits of producers and processors in other countries.87 Canada’s head start in the North American market for hemp seed and oil also would likely affect the profitability of a start-up industry in the United States. This is awesome I just wish I could do more. Submitted by varscience21 on Tue, 08/02/2011 - 11:12. I do believe if this makes it through as a law the economy will change forever. I just wish I could do more as I have no job at the moment I feel I am not doing enough for the cause I have tons of experience with IT as well as electronics, and some gardening experience, as well as sales experience. I also have volunteered my time with norml as well as other organizations dedicated to the cause if someone knows of a good place for me, I am willing to work hard and to see this through to the end. Also Norm Roulet knows me and him and I have talked about me working for him when he gets funded but I feel I need something now. Otherwise I just feel like the otherthousands who believe in changing cannabis laws but are not actually doing anything about it. I am not trying to be cynical just feeling like I am in the sidelines when I need to be out in the field. I just really need a job is all I can be reached at varscience21 [at] gmail [dot] com.